In 1284 Alberto della Scala strengthened the castle Valeggio, dating back to the tenth century already. Between 1331 and the 1348, always under the Scaligers, Fortilizio Borghetto was strengthened and surrounded by a wall. 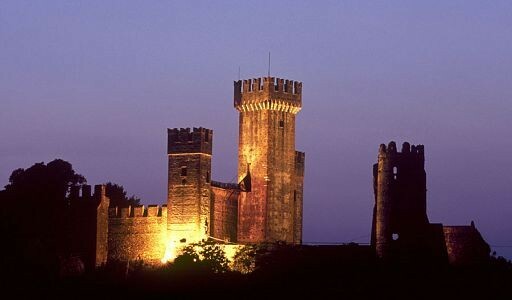 Between 1345 and the 1359 Mastino II and then built the Can Grande II Seraglio and enlarged the Castle. 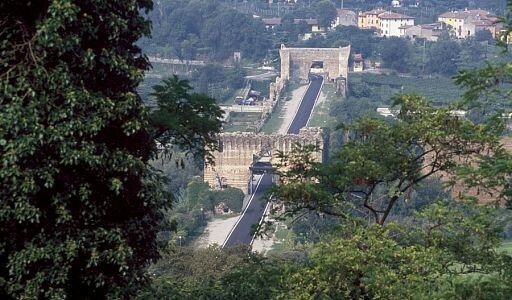 In 1392-93 Gian Galeazzo Visconti, project of the military Domenico Fiorentino built the bridge-dam. - The Castle with Round Tower (from March to October – Sundays and holidays – approximately 10,00 – 13,00 and 15,00 – 18,00 – climb to the summit of the keep of the two side towers). - Visconteo Bridge (open externally). 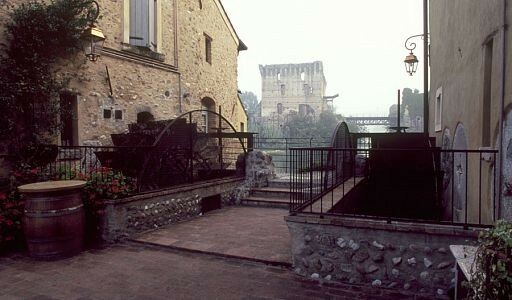 - Walls of Borghetto (externally visible). - Church of St Mark the Evangelist (open before and after the religious ceremonies). - Church of St. Peter in Cathedra (open before and after the religious ceremonies). - Parco SigurtÃ (from March to November – everyday 9,00 – 18,00). - Ancient festival of Salionze – mid-July. - Festival Nodo d'Amore – 3First Tuesday in June. - Antiques Market – 4° Domenico del mese. From the car park in Piazza San Rocco (off Map) you reach the Castle, erected on Mount Ogheri. The complex is divided into three parts (court sud, where today there is a private villa, can not be visited). Gives access to the north (which is dated to the fence 1284), occupied by the tower (strengthened by Cansignorio), Add to difesa Due Torri, Summit on the north-east, by a semi-circular tower open throat, considered pre-existing intervention scaligero. The Intermediate Court and the fence south (parade ground) are attributable to the construction of the Seraglio, that connected the castle to the fort of Borghetto and then continued east for about 16 kilometers (of this work are, in the locality Gherla, the ruins of Castelletto). From the Castle, down through the Municipal Gardens, you reach the bridge-dam Visconti, once provided by curtain walls and three towers. In origine, maybe it was connected by walls above the Castle. It continues to Borghetto (You can reach it by car, Castle, parking to the east of the village), small town on the bank of the Mincio, difeso of mura, partially preserved. The construction of the fort is probably contemporary with the construction of the Seraglio, which ended here. It is accessed through the Northern gate; heading towards the Mincio (right bank), you can see the bridge-dam Visconti, still impressive, although very damaged. Communities: Santa Lucia, Salionze, Borghetto, Vanoni Remelli.